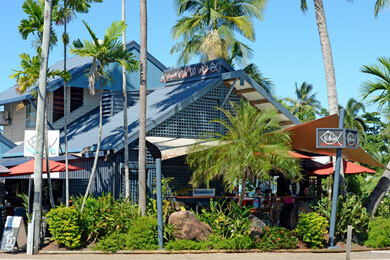 Mission Beach is located in the tropical north of Australia between the cities of Cairns and Townsville. Cairns International Airport is a beautiful two hour drive from Mission Beach passing through lovely tropical landscapes. View Google map for Mission Beach. World Heritage tropical rainforest provides a magnificent backdrop to the small village of Mission Beach which is situated on a stunning natural beach on the edge of the Coral Sea. The Sejala Beach Huts and Beach House are only a short walking distance from the local restaurants and shops where everything you need for your stay is available. Bikes can be hired on a daily or weekly basis, there is a daily water taxi service to the islands and contact our booking office (07) 4088 6699 to arrange car transfers from Cairns International Airport and for all other tours and activities including tandem parachute jumps onto the Sejala beachfront and white water rafting on the Tully River. Mission Beach is one of the last remaining habitats for the endangered and highly protected Cassowary (Casuarius casarius) which are still a common site in the area. They are treasured by the local people and a strong conservation group helps to ensure their protection by nurturing injured animals, stocking remote feeding areas and alerting motorists of recent sightings. It is usual to see the cassowary males and their chicks crossing the roads and wandering through the neighbourhood. 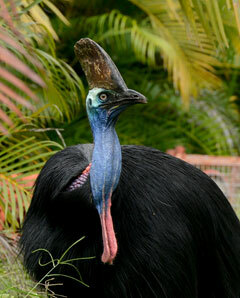 The Cassowary is Australia’s largest land animal. It normally weighs about 60kg, but the heaviest recorded was 94.5kg found north of Mission Beach in 1992. Cassowary eggs are the third largest of all birds at an average 584g (after the Ostrich eggs at 1100g and Emu eggs at 637g). The Cassowary is a large and potentially dangerous animal and out of respect for the birds’ natural home and to prevent injury, humans are advised to stay a safe distance. 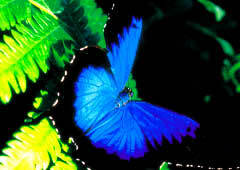 The Ulysses Butterfly (Papilio ulysses) is another famous and beautiful trademark of Mission Beach. It is sometimes referred to as the Mountain Blue and is easily recognised by their electric blue wings. It has become a symbol of tourism throughout Northern Queensland and lives in numerous Australian tropical rainforest areas where plantings of the larval food Euodia elleryana are found.